—when you’re making this with kids, they will be tempted to make other designs out of the dough. Girl made an Easter Island-type design that she called her “guy”. It’s hard to see in the photo, but this “guy” actually has a nose, mouth, eyes, etc. She insisted that I boil him, alone, so that he could be identified and consumed, later, individually. This will make probably the most unusual school lunch contribution that I have ever seen (this coming from a woman that actually owns Japanese hard-boiled egg molds in the shape of a fish, a truck, a bear and a rabbit). —the brown butter gets done much faster than specified, but MAN, is it ever yummy. These will DEFINITELY be considered for Thanksgiving. I think they would travel fairly well and could probably be microwaved, if you watched them very carefully. The pork chops were quite good, too. A little pedestrian, nothing too spectacular, but reliable and would be widely accepted. I cooked the onions (intentionally) for quite a long time, until they were almost caramelized. Definitely easy, a good candidate for “busy week-night” rotation, but not one for entertaining or any kind of special event. The gnocchi, however, would be a stellar candidate for that kind of thing……. I’m making this for dinner tonight – be sure to check back for results. I’ve made the dough and shaped half of the dumplings – I’m saving the other half until Boy and Girl get home from school, because I think (hope?) that they’ll enjoy helping. It’s a little like working with playdough – kinda fun. Hubby is going to buy a camera this afternoon, so I (hopefully!) will actually be able to include a photo! We are invited to a multi-generational big family meal for Thanksgiving (in-laws, out-laws, step-s, ex-es, etc.) and I have high hopes that this will be the dish that I will bring to contribute (and a big VAT of those salad green with pumpkin vinaigrette). I adapted this recipe from a pre-packaged brine mix that I bought on vacation once. After I came home and used the mix, I couldn’t find a place to buy it anymore, so I had to “wing it”. Brining really does make a huge difference, especially with pork, and makes your meat very flavorful and juicy. Mix all ingredients, except pork chops, with 6 cups cool water. Stir well until salt is dissolved. Soak porkchops in salt solution, refrigerated, for 24 hours (I use a Ziploc bag). Remove from brine, discarding brine. Rinse chops and pat dry. Grill (or broil, if you prefer). Yummy. 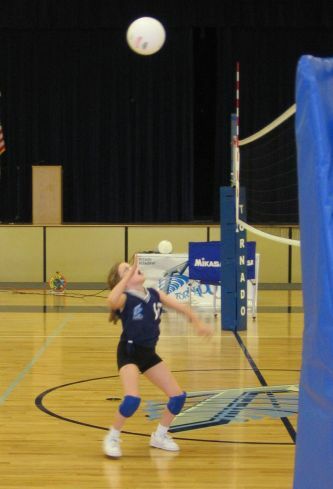 I was downloading photos from Girl’s volleyball tournament this weekend (her team won first place!!!) and it (the camera) fell off the counter where I was working. Now the lens won’t go in and out anymore. I’ve attached a GREAT volleyball photo of Girl for you as a consolation prize – luckily I got those photos all downloaded before it was too late! Girl, in the middle of the front row, with glasses. I was DESPERATELY in need of a new camera, anyway (the power button had been repaired with a thumbtack – I am VERY tough on electonic equipment), so Hubby has promised that he will buy me a new one ASAP. Being a “techie”, though, he feels the need to research and comparison-shop before buying any new electronics, so it may be a week or so before I have one. I did want to mention this meal, however, since I tried a couple of Epicurious recipes. 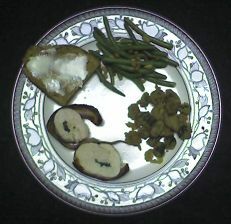 The first was the Basil and Bacon-Wrapped Chicken Breasts from Gourmet magazine (July 1996). This recipe was really good. I added a little parmesan cheese to the basil stuffing, as a couple of the reviewers on Epicurious suggested (I didn’t have feta on hand today). I always work better when I have a photo, and this recipe didn’t have one, so I’m not sure that I assembled the chicken breasts precisely as they were “supposed” to be (and, alas, I’m not providing a photo for you, either), but they were still tasty and fairly attractive. I did have to use some toothpicks to hold the bacon on the chicken in the oven, and almost burned myself trying to put them in, but it did hold together, eventually. The bacon imparted a different flavor to the chicken that I wasn’t super-crazy about, but Hubby and kids LOVED it, so I think it was just my own bias. I’m used to having bacon-wrapped filets, but had never had it with chicken before, so I think it was just “different” for me. The chicken was, however, VERY moist and juicy. This Green Bean recipe (from September 1999 Gourmet magazine) was really good and VERY easy, although I did adapt it a little. I didn’t have almonds on hand, so I substituted pine nuts, which were quite good. The butter did foam alarmingly while I was saute-ing the garlic and nuts, but it turned out fine in the end. I cooked the green beans in chicken stock for a little extra flavor. Sometime, I’ll post my recipe for making homemade chicken stock. It’s time-consuming, but WELL worth the effort, if you haven’t ever done it, and is a rewarding thing to do on a rainy day. I know that Fried Okra doesn’t “go” with this, but the kids love it and had been asking for it. I made some a month or so ago and had it frozen, so I pulled it out to make them happy tonight. It freezes much better than I would have expected (this was the first time that I had tried it), although nothing compares to having it right out of the hot oil. When I froze it, I placed it in a single layer on a cookie sheet lined with waxed paper and then put it in the freezer until the individual pieces froze, then put it in a Ziploc bag. To reheat, I put it (straight out of the freezer, not thawed) on a cookie sheet (lined with foil and sprayed with Pam) and baked it at 400 degrees for 15 minutes – that was the time and temperature that tonight’s chicken had to bake, so I just put it in there with the chicken. We had some Pizza Bread, from Great Harvest, also to go with this. Yummy. 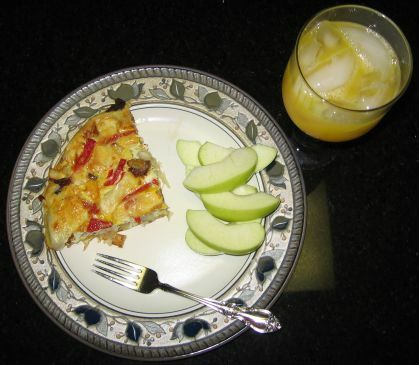 A quick, easy lunch (we were still full from frittatas until about 2:00!). This looks kind of weird in the photo, but they were actually pretty good! Mix together ketchup, mayo, horseradish and relish (this is just basically Thousand Island with a little kick). Spread a generous amount on one side of each slice of bread. 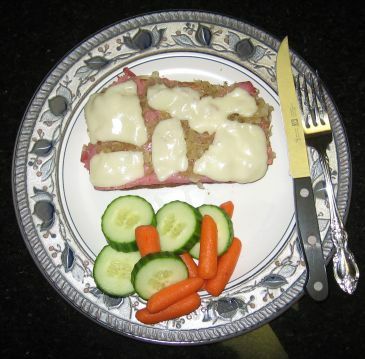 Next, top each slice of bread with corned beef, then sauerkraut, then Swiss cheese. Bake at 300 degrees, watching closely (I use my toaster oven), until meat is warmed through, bread is toasted and cheese is melted, about 3 to 5 minutes. Serves 2. Hubby works from home, so we are lucky enough, some days, to be able to have a nice breakfast together after we get the kids off to school. One of our favorite things to have is a frittata. They usually require only one pan, are easier to make than omelets (no spilled filling, no falling apart when you take them out of them pan and they require less cheese), and are a great way to use up leftover veggies and meats. I happened to have some nice leftovers (roasted red peppers, white asparagus and shaved Gruyere) and put this one together this morning. Preheat oven to 350 degrees. Start bacon cooking. As bacon cooks and fat renders, spoon the bacon fat off and place it into a 10″ non-stick, oven-proof skillet. When you get enough bacon fat to coat the bottom of the skillet, cook the potatoes in the bacon fat until golden and tender on the inside and slightly crisp on the outside, stirring occasionally so that all sides are browned. When bacon is cooked, drain it well and set it aside to cool. When potatoes are done, turn the heat off and add the asparagus, peppers and the bacon (crumbled) to the pan. Pour the eggs over the ingredients, then sprinkle the cheese over the top. 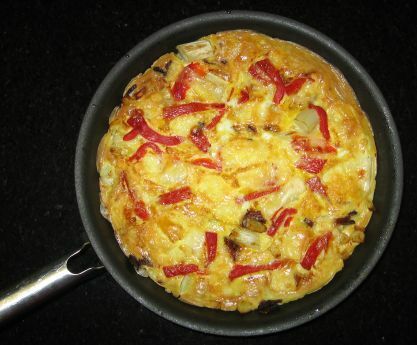 Quickly place the skillet into the oven and cook until the frittata is firm and the cheese on top is slightly browned (15 – 20 minutes). I turned the broiler on for the last 1-2 minutes to get a nice, golden top, but that is optional. Cut the frittata into wedges and serve. Makes 4 servings. This was SO good. One addition to this recipe that would have improved it would be some onion or shallots. I would add a few Tbsp. of chopped shallot or red onion (maybe even chopped green onion?) to the potatoes during their last minute or two of cooking time and then proceed with the recipe. Nozzole Chianti Classico (Italy) – This was medium-bodied, with spicy hints of cherry and rosemary. I was wishing for a big plate of Spaghetti Bolognese to go with it. Conde de Valdemar Gran Reserva Rioja (Spain) – Beautiful color and subtle oak flavors. I thought I tasted a bit of caraway/celery flavor, too. Ben Marco Malbec (Argentina) – VERY dark, smooth, full-bodied. Plum flavors. Buehler Cabernet Sauvignon (California) – Mmmm…..full, rich, chocolate-y flavor. Reinhold Haart Piesporter Spatlese Riesling (Germany). Normally, Rieslings are way too sweet for me, but this one was very good and spicy, even though “Spatlese”, we learned, means that the wine was made from the last grape harvest of the season, so the grapes are usually a little more mature and sweet. I actually bought a bottle of this and will serve it the next time we have something really spicy (Thai?) for dinner. I first encountered Kataifi (I’ve also seen it spelled “katafi”. I’m not sure which is right, but on my box of dough, it said “kataifi”.) at one of my favorite restaurants, Artie’s, in Fairfax City, Virginia. They have blue crab fritters that are breaded with kataifi (finely shredded phyllo dough) and served with roasted corn salsa and ginger lobster butter. They are SO delicious and you should definitely stop and have some, if you are in the Northern Virginia/Washington D.C. area. I used Emeril’s “Baby Bam” spice, which is a “bammed-down” version of his “Essence” spice. The recipe for this great seasoning is in his “There’s a Chef in My Soup” book, but it contains paprika, salt, parsley, onion and garlic powder, black pepper, oregano, basil, thyme and celery salt. I use “Baby Bam” on almost everything and even keep a glass jar of it out on my counter, near the stove, with the salt, pepper and olive oil. The chicken strips were good, and the chicken itself had good flavor, but the phyllo was fairly bland. I don’t know if I over-breaded and there was just too much, but I think, if I made these again, I might sprinkle a little Baby Bam over the top of the strips before they’re baked. The good news is that the sauces were pretty flavorful. Hubby decided to use them (well, mostly the raspberry) for “dousing” sauces, instead of dipping sauces, and I think that’s probably the best way to go. 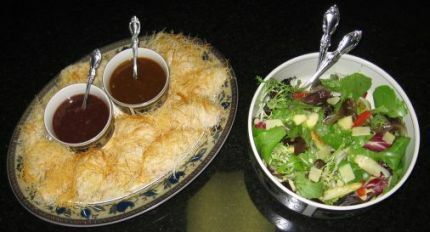 The strips, with all of the crumbly, dangling kataifi, are a little unwieldy to be “finger food”, so they pretty much require a fork, anyway, so having them covered in sauce is not an inconvenience. Both Boy and Girl liked these. They were both good, but the Raspberry sauce really wasn’t that spicy. I didn’t have seedless raspberry preserves, so I just used what I had, which did have seeds, but it was fine. Girl preferred the apricot sauce. Boy liked the chicken plain, with no sauce. This dish actually might have been really good with a roasted corn salsa (with chopped tomato, black beans, a little onion and cilantro). I still had some leftover mixed salad greens from Hubby’s party, so I went to Epicurious and did a quick search for a “4-fork” rated salad and came across the Mixed Greens with Roasted Asparagus and Apple. A bonus was that I still had some Gruyere on hand from our recent fondue experiment, so all I had to buy at the store was apples and asparagus. My store happened to be out of regular old green asparagus, and only had the white (it IS out of season right now – I should have known better), but it looked good, so I thought I’d give it a shot. 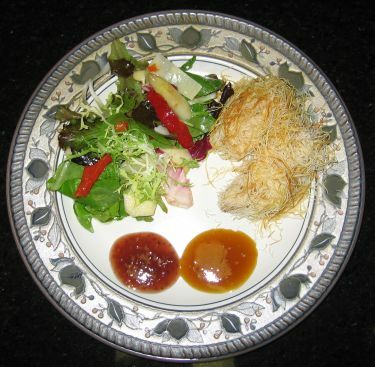 The salad was good and Girl liked it, but Boy has decided that he’s not a great big vinaigrette fan, so I may have to lay off it for a while, or add just a tad bit more sugar to his portion of the dressing. The salad tasted fine, but since I used the white asparagus, almost everything had the same color (white-ish apple, white-ish cheese, white-ish asparagus), except for the salad greens. I did add a bit of roasted red pepper, because I still had some on hand, but it was a little difficult to see if you were eating a chunk of apple or a chunk of cheese, since it all looked similar. Having the green asparagus would’ve helped, I think, but it was pretty good, anyway. We had a family dinner party last night to celebrate Hubby’s 40th birthday. Hubby requested Mangia’s Pizza (the Jeff’s Special is TO DIE FOR) and salad for the meal. I had some leftover Jerked Pumpkin Seeds from the Butternut Squash soup that I made recently and decided to come up with a salad that would work with them. This salad was a MAJOR hit – the guests loved it and there was absolutely not one bite left – a few guests even went back for seconds! This will make a HUGE batch (about 16 servings), so feel free to adjust quantities as necessary to suit your needs. Girl is a big onion fan, so she liked this salad better than Boy. The salad is is still pretty kid-friendly (apples, carrots, sweet peppers), though. If your kids aren’t fans of slightly spicy things, you might leave the pumpkin seeds out of the kid portions. Gently toss together all ingredients EXCEPT pumpkin seeds, Parmesan and vinaigrette. Pour vinaigrette over salad (you’ll probably need all of it) and gently toss again to coat. Sprinkle a little Parmesan and a few pumpkin seeds over each salad serving as it is plated. Pass remaining pumpkins seeds for anyone that likes their salad “extra crunchy” and would like more. Combine all ingredients except the olive oil into a small bowl. Whisk well. Add olive oil and whisk until incorporated. Makes about 1 cup. Pour the melted butter over pumpkin seeds, add the Jerk seasoning and stir. Bake at 250 degrees for about an hour, turning and stirring about every 15 minutes. This seasoning can also be used as a rub on meats before smoking or grilling. I also used it to make Jerked Cashews and Pecans recently for a great cocktail snack (follow the same instructions for making the Jerked Pumpkin Seeds). Wasabi-Miso Marinated Flank Steak from Cooking Light, my absolute most favorite food-related magazine of all time. Their new cookbook (The All-New Complete Cooking Light Cookbook) is an update of the one that they put out a few years back and it is absolutely awesome! I even gave it to two friends for their birthdays recently. Potato Gratin with Gruyere and Creme Fraiche is from Bon Appetit a few years ago. This is one of my all-time favorite recipes, great with lots of things – fancy enough for an adult dinner party, but very kid-friendly. I didn’t put the parsley on top of it tonight, because I didn’t have any – but it was still great! Rice probably would have been a more appropriate choice with this meal, but I just felt like steak ‘n’ taters! To go with this, I steamed some edamame, in the shell. I like the organic (frozen) edamame from Costco – it comes with multiple single-dinner-size packets in one big bag. It tastes lots better if you add plenty of salt to the cooking water. My kids think it’s really fun to use their teeth to scrape the beans out of the pod – kinda like eating artichoke leaves. 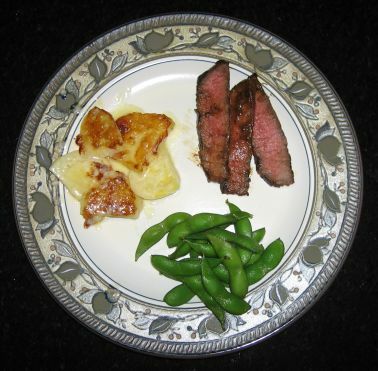 Overall, this was a good dinner, but I’m not sure that I would make this flank steak recipe again. The mirin in the marinade made the finished product VERY sweet and the specified amount of wasabi didn’t add enough spice to counterbalance it – even the kids said that it was too sweet! Using real sake, instead of sweetened mirin, might have helped, but it just wasn’t a standout. A friend of mine made the Flank Steak with Cilantro-Almond Pesto, however, which is the recipe on the same page as the Wasabi-Miso Marinated Flank Steak in the cookbook, and she said that it was outstanding, so I’ll be trying that one next. Gonna go have some leftover Key Lime pie for dessert…….mmmmmm……..